Add a Raspberry Pi to your Egg-Bot « Adafruit Industries – Makers, hackers, artists, designers and engineers! 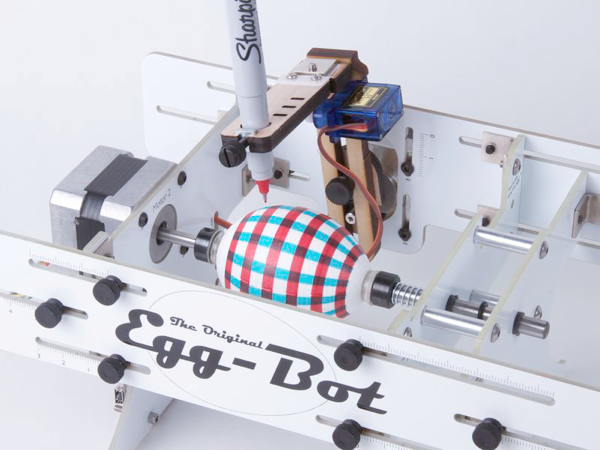 The Eggbot is super adjustable, and is designed to draw on all kinds of things that are normally “impossible” to print on. Not just eggs but ping pong balls, light bulbs, mini pumpkins, and even things like wine glasses– with a bit of work. See the photos above for some examples of personalized golf balls, christmas ornaments, light bulbs, and (yes) eggs. The Eggbot kit is easy to assemble in a couple of hours, and only requires a couple of basic tools like miniature Phillips-head and flathead screwdrivers. No soldering required. You’ll also need a recent-vintage computer with an available USB port (Mac, Windows or Linux), plus internet access to download assembly instructions and necessary software. I went a little further and installed a VNC server on the Pi and a VNC client on my iPhone, now we have an autonomous EggBot which needs no external computer, keyboard, mouse or monitor — it is all controlled wirelessly from iPad or iPhone. Please see the video at http://www.instructables.com/id/iPad-controlled-Raspberry-Pi-powering-an-EggBot/ . 2) Browse to the Evil Mad Science Labs EggBot wiki page and download the Linux Eggbot extensions and examples. 4) Follow the directions at http://www.penguintutor.com/linux/tightvnc to add the VNC server to the startup of the Pi. 5) Install the free app “Mocha VNC Lite” on your iPad or iPhone. 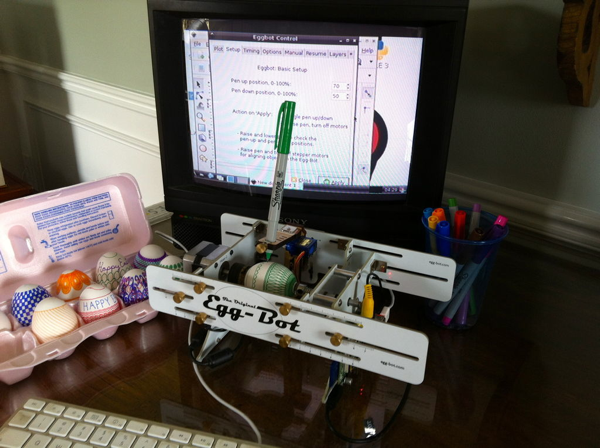 Now run the EggBot from your iPad/iPhone.